Bring them to boil in a small pan together with the cider, sugar, saffron and a few drops of lemon juice. Cover and simmer at a low heat for around 15 minutes, turning the pears occasionally. Leave to cool in the syrup. Remove pears and reduce syrup to around 4 tablespoons. Mix cooled syrup with yoghurt. 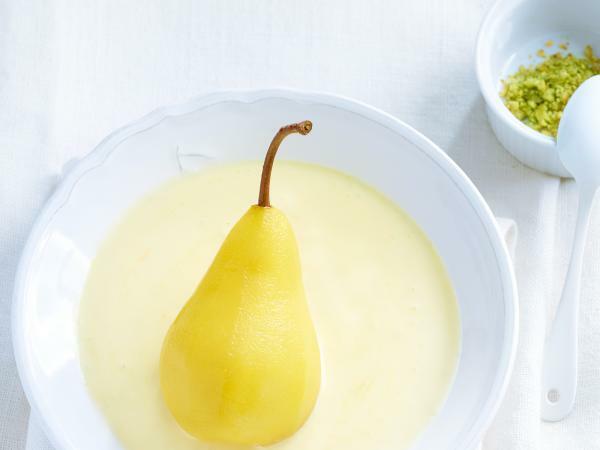 Serve pears with yoghurt, sprinkle with pistachios.